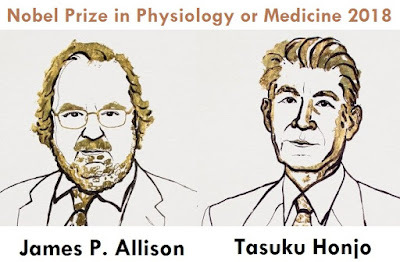 The Nobel Prize in Physiology or Medicine 2018 was awarded jointly to James P. Allison and Tasuku Honjo "for their discovery of cancer therapy by inhibition of negative immune regulation." 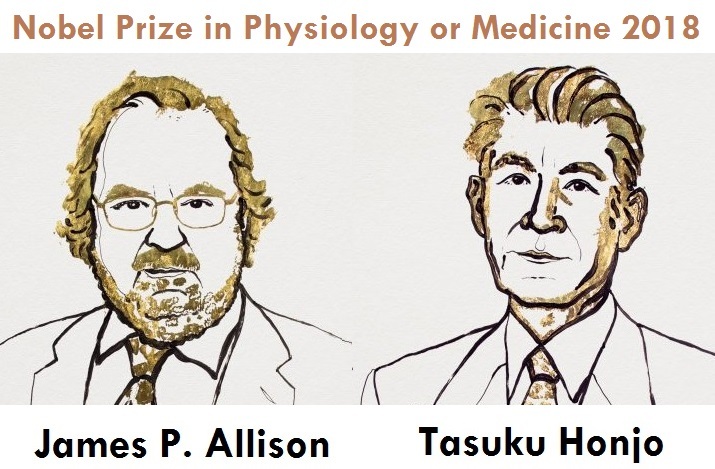 Prize motivation: "for their discovery of cancer therapy by inhibition of negative immune regulation." Jeffrey C. Hall: "for their discoveries of molecular mechanisms controlling the circadian rhythm"
Michael Rosbash: "for their discoveries of molecular mechanisms controlling the circadian rhythm"
Michael W. Young: "for their discoveries of molecular mechanisms controlling the circadian rhythm"
108 Nobel Prizes in Physiology or Medicine have been awarded between 1901 and 2017. 12 women have been awarded the Medicine Prize so far. 32 years was the age of the youngest Medicine Laureate ever, Frederick G. Banting, who was awarded the 1923 Medicine Prize for the discovery of insulin. 87 years was the age of the oldest Medicine Laureate ever, Peyton Rous, when he was awarded the Medicine Prize in 1966 for his discovery of tumour-inducing viruses.